This is a scenario for the final battle of this encounter between the Greeks and the Persians. It postulates a series of conflicts starting with the 300 Spartans at Thermopalye, continuing with the sack of Athens and a drawn result at Plaatea. In this mythical scenario Xerxes did not retreat back to Persia but continued the fight with a reduced army. The Persians did not occupy Thebes – rather the Theban/Boetian group joined the other Greeks in a confederation to defend their common homeland. The remaining Persian Host is in battle array in Boetia facing a combined but also reduced Greek Alliance! This confederation includes Sparta (with their ally: Corinth), Athens (with their allies: Plaatea, Megarra and some Ionians) and Thebes (with their allies Boetia and Phokia). This Greek army numbers slightly over 33,000 men. 21,000 are Hoplites with the remaining 12,000 consisting of light infantry (Peltast Class) and Psiloi. These well-painted Greek Warriors make a brilliant panoply in their serried Phalanxes! My Persian Host of some 56,500 men drawn from “Herodotus’s List” is a stunning array of colors and unusual troops. I think it will make your jaw drop! It has been a goal of mine for over 40 years to duplicate that exotic listing. Xerxes has remaining over 5,000 Cavalry (Heavy and Light), 5,700 Guard Infantry comprised of Immortals, Kinsmen and Noble Guard, 12,800 Sparabara formation Infantry ( quality motivated soldiers) consisting of native Persians, their cousins the Medes, Hyrcanians, Kissians, Bactrians and Saka. 6,700 Spearmen of moderate value, 3,800 lesser quality Levy Spearmen, 5,700 Archers of moderate value excepting the Indians and Saka who are of exceptional quality, 12,000 Light Infantry Auxiliaries (Takabara) equivalent to Greek Peltasts and 4,800 Psiloi - some of questionable worth excepting a few more motivated types. About 1,000 Camel-riding Midianite Arab archers complete the roster. The Greek Alliance is initially comprised of Spartan high-quality Hoplites with a significant amount of both Peltast and Psiloi-type Light Infantry. The Elite Guard including the “300” is extremely powerful! They bring along the Corinthians as Allies. The Athenians offer a large number of Hoplites reinforced with Plaateans, Megarrans and Ionian Greek Hoplites from the Islands of the Agean. The Thebans have reconsidered and rejoined their own kind for this last showdown. They supply Hoplites and their Elite “Sacred Band”of Guard-level warriors of very high quality. The Phokians and Boetians have joined the Thebans to add to their numbers. 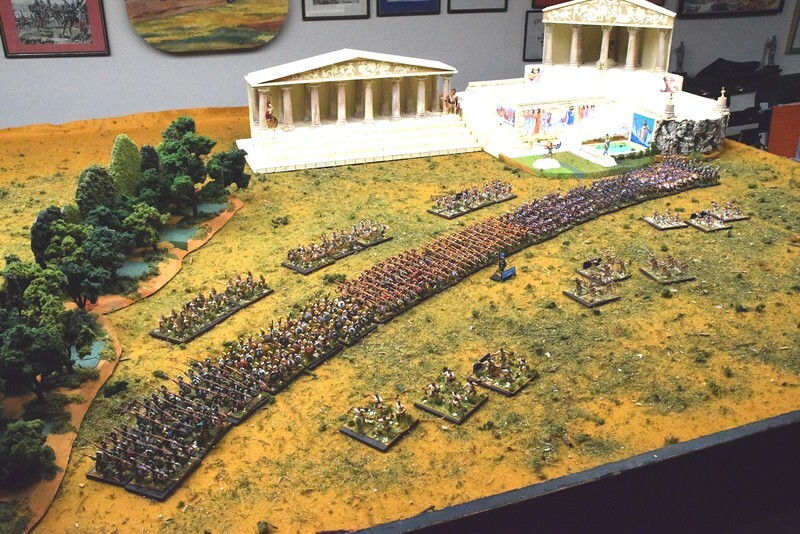 Both the Athenians and the Thebans are providing large numbers of Peltast and Psiloi Light Infantry. This is a powerful confederation! The ratio is 1 model = approximately 40 actual combatants on the field. The Rules being utilized in this game are DBE (An approved variant of Phil Barker’s DBA negotiated by Duke and Phil some years ago referred to as De Bellis Extravaganza – Duke’s term). Mainly the difference is in the mounting of the figurines that are all in double ranks with twice as many figurines. A unique twist has been applied to horse archers. In addition, some units have been given special ratings or abilities to emphasize their elite or quality status. The Sparabara mechanic is also different as the front rank is usually comprised of a large spara bearer with spear and a second rank of spearmen with smaller shields. The back ranks are all archers that may fire at full effect over the heads of the front rank spearmen using the sparas as a pavise. A couple of the sparabaras are not equipped with the great sparas but have two ranks of spearmen with slightly larger shields in place of the great sparas. Some Persian Guards Cavalry are given an extra point as are the Spartan Guards and the Theban Sacred Band in representation of their greater elite fighting abilities.. The game requires a 24’ x 5’ table area. This requires 6 banquet tables in pairs. A large felt overlay and plop-ons make up the diorama plus over two thousand five - hundred figurines. 6 Major Persian Commanders with additional Xerxes and possible 6 minor Persian Assistants. 3 Major Greek Commanders with 3 minor Greek Assistants and possible Unknown Oracle. Total 20 players maximum – 9 players minimum. This is a figurine feast for the ancient period afficianados.